Donal Ahern winner of the IPADPFE now part of the Neopost Group recently held another tradeshow, this time in the Silver Springs Hotel on Tuesday the 13th of March. The event, titled,’ Opportunities in Print’ saw displaying a wide range of equipment targeting both the commercial print sector and sign makers. 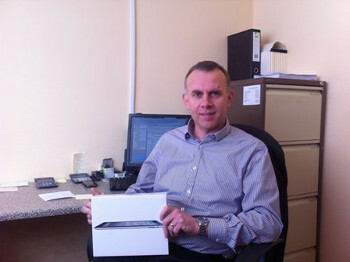 As usual a new IPAD was on offer for some lucky visitor and Donal Ahern of Kanturk Printers, Co. Cork was the prize-winner on the day. PFE: Duplo finishing range, Roland wide format range, Drytac Laminator and Keencut Evolution. Wildcard Software: Printlogic System: Complete MIS System, Estimation, Fulfilment, Accounts etc. DWS Supplies: Digital Print Materials, Range of Plotter cut materials, Avery Tapes etc. If you were unable to attend our recent tradeshow you can contact any of the following companies for details as to the types of machinery that were showcased.